The headline in the Globe and Mail blared Ottawa fights EU's dirty fuel label on the oil sands. Indeed, Canadians have been getting pressure from a number of quarters in the environmental movement over the issue of how oil is extracted from oil. The jungle (think hot, steamy and snake infested) has now become the rain forest. Swamps (aligators and mosquito infested, etc.) are now wetlands. I was at a lunch last week with some investment bankers when one suggested that the whole process is one giant environmental cleanup. We are cleaning up a natural environmental disaster and supplying the world with energy, a win-win proposition. There is a federal election in Canada. Is anyone listening to this idea? Will anyone stand up for the country this way and become Kaptain Kanada (which incidentally is another re-branding effort)? Does the Pentagon have a downward sloping demand curve? Mankiw believes that terrorists have downward sloping demand curves. It is unclear whether Mankiw, or anyone else, believes that the Pentagon does as well. Meanwhile, the Portguese government has collapsed over a proposed austerity package. It looks like it is in need of a bailout and its bond yields are blowing out. What's more Standard and Poor's reported that European banks would need another €250 billion of capital in a stress test scenario and the Irish Times reported that the ECB has planned an emergency €60 billion for Irish banks. It appears that Richard Koo is right about balance sheet recessions. Not only America, but Europe is doomed for an endless loop of stimulus-tighten boom-bust cycles that we saw in Japan's Lost Decades. Under this kind of economic backdrop, investors who use buy-and-hold approaches to portfolio construction are likely to see disappointing returns. I would advocate the use of models that trade these intermediate term swings like the Inflation-Deflation Timer Model. A week after the Inflation Deflation Timer Model moved from an "inflation" to a "neutral" reading, largely because commodity prices have rallied sufficiently for the model to return to an "inflation" reading. As a reminder, the Timer Model relies on commodity prices as a barometer of global growth and asset inflationary expectations. Mark Thomas posted this chart at Economist's View that confirms our hypothesis. These trend-following models have the unfortunate problem of occasional signals that whipsaw. Nevertheless, I must therefore respect the discipline of a well-defined investment process and re-orient the model portfolio to inflation hedge and growth vehicles, such as resource and emerging markets stocks. Could this signal be a fake-out? Deep down, I have some misgivings that this signal is a fake-out and a return to the risk trade is a just a product of reflex rally from a deeply oversold condition. The confirming indicators that generated the "neutral" reading last week remain in a neutral condition (see my previous comment here). Simply put, I believe that too much technical damage has been done for the markets to roar back to new highs. As an example, the price of Dr. Copper has broke down from an uptrend and appears to actually be in a downtrend. Similarly, the ratio of US Consumer Discretionary to Consumer Staple stocks as a measure of risk aversion also indicates that the relative uptrend remains broken. Despite my personal reservations, I have found that the Timer Model's signals have in the past been better than my own opinion. Therefore I have opted to rely on the discipline of Timer Model instead. Were any additional risks were to arise, the risk control parameters of the model also allow me to define and limit portfolio risk. A pending earthquake in Europe? In the face of the earthquake in Japan, the BoJ acted to inject liquidity into the system. The Fed sounded somewhat dovish on inflationary expectations in its last FOMC statement. By contrast, I wrote on March 3 that the ECB stated that it expected to rates to start rising as early as April. Since then, many analysts have pooh-poohed that statement by pointing out that the European periphery remains weak and the ECB couldn't possibly raise rates. ECB President Jean-Claude Trichet said he had nothing to add on the bank's monetary policy stance to his comments at its last policy meeting on March 3, when he shocked financial markets by announcing that an April rate rise was possible. Mario Draghi, who heads the Bank of Italy and is tipped as a possible successor to Trichet, said the ECB "remains prepared to act in a firm and timely way" to ensure inflationary risks do not materialise. Trichet's term as ECB chief expires in October. Meanwhile, Portugal faces a crisis in April and Mish pointed out that the Portuguese government is on the verge of collapse. When I awoke on March 11 to the news of the devastating earthquake in Japan, what I found equally disturbing for the financial markets was that bond yields in the European periphery were blowing out. If the ECB continues on their hawkish course, it risks destabilizing the financial system in Europe and set off another earthquake with aftershocks that could reverberate around the globe. I wrote about this trading model from Trader's Narrative before last week. The model, which uses the 50 and 150 day moving average in a rather unique fashion, moved to an oversold condition (ratio of 0.50 or less) and is in the process of rallying off that signal. As I don't have the exact figures for the signals and for the market. I eyeballed the charts for the past instances of rallies off an oversold condition, it appears that such conditions have been good for rallies of at least two weeks and the magnitude of the rallies for those two weeks have been in the 5-10% range. Sentiment models also offer support for the bull case. Sentiment readings from different sources also indicate that investor bullishness has pulled back from excessively bullish extremes. In some cases, they are at or near "buy signal" territory. To be sure, geopolitical events surrounding Libya and Bahrain are likely to add to near-term market volatility. Nothing goes straight up or down, but if this trading model is correct then equity prices will have an upward bias for about two weeks. While disasters aren't necessarily specifically forseeable, we do know that they do happen. 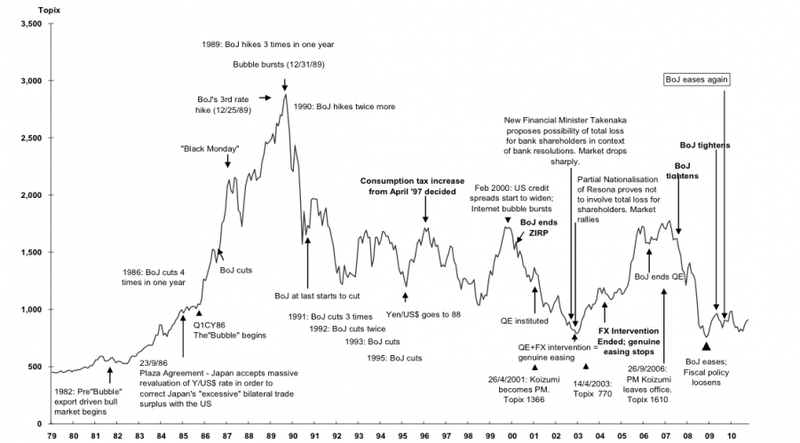 With the onset of QE2, I have seen too many people focus only on the upside (e.g. rare earths as the hot new story du jour) without thinking about the risks involved. When markets de-risk and investors head for the exits, those without a risk management plan in place often get trampled. There are some other important points in the Stratfor essay that is well worth reading. Living in Vancouver, I recognize that I am in an earthquake zone and we have a stash of emergency supplies, e.g. potable water, etc. Financially, I depend on the Inflation-Deflation Timer Model, which is designed to limit losses in the case of financial crisis but at the same time allow winners to run. Regular readers know that I believe that the Fed has been throwing a party, in the form of QE2. Valuations are getting stretched, but in the short-term, neither valuation nor macroeconomic conditions matter. Only momentum and liquidity does. The key for traders, therefore, is to enjoy the party but to keep an eye on the exit. Well, it seems that someone finally called the police to the Fed's party and the cops are on the way. The first clue was given by the Inflation-Deflation Timer Model, which recently moved from an "inflation" reading to a "neutral" reading - a signal that investors should shift from the high-beta trade to a more neutral stance. 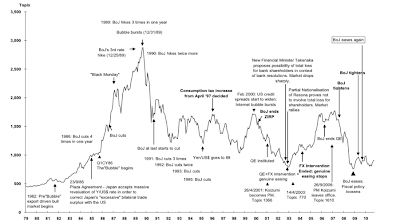 The Timer Model, uses commodity prices as a barometer of global growth and inflationary expectations. Commodities have begun to weaken and have broken down through the uptrend which began in September 2010. Cyclically important commodities such as copper also show a pattern of a break from its price uptrend. Similarly, measures of risk aversion, such as the ratio of Consumer Discretionary stocks to Consumer Staple stocks, are behaving the same way. 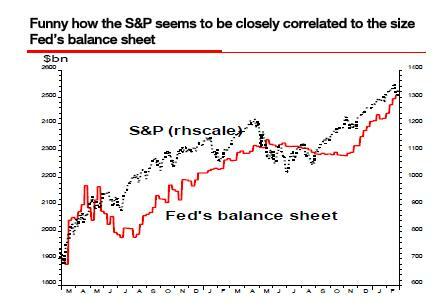 The chart below from SocGen shows a remarkable correlation between the Fed's balance sheet and US equity returns, which reflect the effects of quantitative easing. If you look closely, there appears to be a 1-3 month lead between quantitative easing program and stock returns. Assuming that QE2 ends on time at the end of June and it is not followed by QE3, now is about the right time to head for the exits. Tactically, the market appears to be oversold on a short-term basis. This model, which uses the 50-day and 150-day moving averages in a rather unique way, just flashed a buy signal on stocks indicating a favorable near term risk-reward ratio. At the end of February, for example, the HSNSI stood at 58.2%. By last Thursday night, this benchmark had already dropped to 49.1% — and since then has dropped even further to 43%. This is a surprisingly big drop, given that the Dow — at least so far — is only about 3% below its bull-market high, hit in mid-February. This fear factor is even more in evidence among market timers who focus on just the Nasdaq market — an arena where the mood among retail investors particularly predominates. The Hulbert Nasdaq Newsletter Sentiment Index (HNNSI) currently stands at just 20%, down from 73% on the date of the market’s mid-February high. This retreat of the bulls is not what is normally seen at the beginning of a major decline. If the bull market had truly ended at its mid-February high, and sentiment adhered to the typical pattern, then the bulls would have stubbornly clung to their positions — if not actually increased them in the wake of the decline, treating the market’s weakness as a buying opportunity. While my inner trader remains relatively sanguine and is ready to take some risk off the table on market strength, my inner investor is whispering, "This is starting to look a lot like Lehman..."
Valuation and macro risks are everywhere. The Tobin Q ratio, a measure of the market value of equities to replacement cost, shows the market to be immensely overvalued. Jeremy Grantham's estimate of fair value on the SPX is about 900, compared to the current level of about 1,300. Then we have to contend with stories of unrest in Bahrain, Libya, Yemen and, the elephant in the room, Saudi Arabia. On top of that, we have the risk of European default and the possibility of another downleg in the US real estate market. Then there is China. The most recent report of a trade deficit was shrugged off because of poor seasonality. Maybe it's true, maybe not. The weakness in copper and other commodity prices is worrying as there have been reports that the Chinese have been speculating in commodities on margin and possibly pyramiding their positions. Prolonged weakness in commodities could send not only commodity prices, but investor confidence, into freefall. If the Chinese had indeed been hoarding commodities on credit and prices turned down, any orderly retreat would easily turn into a panic and, in the words of Dennis Gartman, "a margin clerk market" where everything is liquidated to meet margin calls and the correlation of virtually all asset classes converge to 1. Investors should re-calibrate their risk tolerances with care. Traders can try to catch the rally but don't forget to define their downside risk control parameters. As I write this, the Nikkei was down 10.5% on the back of worsening news about its nuclear plants. The STOXX has cratered 3.5% and most global bourses are down 2-3%. Dow futures are off over 200 points. Meanwhile, the bond market is on a tear. Today also happens to be the day of an FOMC meeting. Going into the meeting, there had been some speculation that the Fed may come out with a more hawkish statement in order to bolster its own inflation fighting credentials. ...but then there is a problem of that "explosion" in Japan. Assuming that the tendency is for the Fed to become more vigilant on the inflation front, how would the FOMC statement reflect those concerns in light of the market turmoil? Aren't central bankers genetically programmed to be financial fire fighters? This is a real-time test of the Bernake Put. All eyes should be on the FOMC statement at 2:15 EST. Addendum: The BoJ has already take steps to inject liquidity into the system. Is the FOMC watching headlines like Bank of Japan Fails to Contain Investor Panic as Nuclear Danger Escalates? Stay tuned. Over the weekend, I have been pondering the potential problems at the two Japanese nuclear plants after the 8.9 earthquake on Friday. In the grand scheme of things, any problem seems to be contained and damage is likely to be relatively minor - though the Japanese are by no means out of the woods. The earthquake that hit Japan was 5 times more powerful than the worst earthquake the nuclear power plant was built for (the Richter scale works logarithmically; the difference between the 8.2 that the plants were built for and the 8.9 that happened is 5 times, not 0.7). So the first hooray for Japanese engineering, everything held up. The Japanese been expecting the "Big One" for decades so this earthquake was hardly a surprise. They have built much of their infrastructure with a major earthquake in mind. It is therefore a testament to their preparedness that a far more powerful earthquake (8.9) struck Japan and left it with a death toll in the tens of thousands (and much of that was from the tsunami and not the earthquake). By comparison, the 2010 Haiti earthquake was far less powerful (7.0) but produced a death toll of over 300,000. By contrast, the world went through a financial earthquake in 2008 when Bear Stearns and Lehman Brothers collapsed. So it was a shock when I saw Bloomberg report last week that an "International Monetary Fund report shows that regulators haven’t gone far enough in taming potential financial-market excesses since the economic crisis began." There are macro risks everywhere. Should another financial earthquake occur, it should not be a surprise to anyone. Have we learned nothing? Where is the redundancy that is found in nuclear power plants? Where is the "defense of depth", or any defense? After yesterday's selloff, the 50-day moving average failed to halt the decline of the SPX, but the market is oversold on short-term measures. The North American markets woke up this to two key pieces of news, which upon further reflection, may not be as bad as anticipated. First of all, global markets sold off on the news of the massive earthquake in Japan and there has been tsunami warnings issued all over the Pacific Rim. Early indications are the tsunami has fizzled. Taiwan lifted its tsunami warning, as "the biggest waves that reached Taiwan after the earthquake were detected at Wushih, in northeastern Taiwan's Yilan County, but they had a height of just 12 centimeters." In addition, the much anticipated Saudi "Day of Rage" protest has fizzled because of a strong security presence. Will the market continue to weaken or will these silver linings spark a rally? How the market reacts to news like this will be a key "tell" to the health of the bull. In a conversation with a friend, I was accused of being overly dark and pessimistic in tone in my writings. As a change of pace, I want to highlight a more optimistic view of the events in the Middle East-North Africa (MENA). During Brazil's two decades of military dictatorship, it would have been unthinkable that a female former revolutionary would lead the country in the 21st century. That transition, from autocracy to democracy, might offer some lessons for rebels across the Arab world, Brazil’s longest serving foreign minister told a forum organised by the Al Jazeera Centre for Studies in Doha, Qatar. "Who would have thought an intellectual, a metal worker and a kind of revolutionary would follow a military dictatorship?" Celso Amorim, the former foreign minister and career diplomat, told a crowd on Thursday, speaking about Brazil’s former and current leaders. "Whatever happens [rebellions across the Arab world] will create a new political situation in the Middle East. This is for certain," he said. Economic liberalization should proceed political liberalization: Economic liberalization resulted in crony capitalism and a widening gap between rich and poor - a topic that I have written about extensively before. Closed systems are necessary to prevent Islamists from taking power: Remember the Domino Theory in Southeast Asia? Elections equal democracy: We learned that lesson when the Union Jack was taken down around the world after World War II. One man, one vote, once! The international community has no role to play: Not sure if I agree with that. Too much foreign support, or meddling, robs a government of its legitmacy. Enough optimism. After this rousing chorus of We Shall Overcome, back to your regular programming. The value of the dollar's net short position rose to $34.9 billion in the week ended March 1 from $22.36 billion a week earlier, according to CFTC and Reuters calculations. It was the largest net short dollar position for which Reuters has data, dating back to June 2008. The other side of the coin of the short USD trade has been the skyrocketing commodity price. 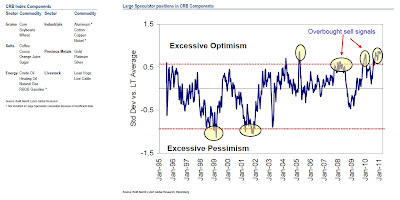 Maryann Bartels of BoA-Merrill Lynch aggregated the COT positions for large speculators in the CRB Index and found that large speculators (read: hedge funds) are in a crowded long position in commodities. In the short term, the news from Libya has also served to push up oil and gold prices. We are also seeing strong momentum and funds flows from traders continuing to pile into the cyclical or reflation trade. Despite the 3% drubbing taken by Dr. Copper yesterday, the CRB Index continues to rally to new recovery highs. Nevertheless, this kind of sentiment backdrop represent high risk conditions for the stock and commodity markets. For traders who want to stay long, I advise a high degree of risk control in order to define the level of losses you are willing to bear. Meanwhile, enjoy the party. What I am watching for: There have been rumors circulating that Qaddafi is negotiating the terms of his resignation. If that were to happen, oil and gold prices will crater and that will remove the geopolitical noise from commodity prices. In the event that the Libyan risk premium contracts from recent levels, what I am watching more carefully is the price reaction of the entire commodity price complex to the market environment. It's not just energy and precious metals, but how the softs, agricultural and industrial commodities react for a sign of how market expectations of global growth and inflation are developing. Tunisia, Egypt and now Libya. Now the markets are watching Yemen, Bahrain, Oman and Saudi Arabia for signs of emerging geopolitical risk. Could the Davis Affair blow up the emerging markets risk trade? According to Pakistani police accounts, Mr. Davis was driving a white rental car on the congested Jail Road in Lahore on Thursday when two men on a motorcycle tried to rob him. The American shot the two men, police officials said. Police accounts initially differed on whether the two assailants were armed, but according to the official police report released Friday, the police found weapons on the dead men. Mr. Davis did not have a license to carry a weapon, the law minister said. Mr. Davis called the consulate for help during the episode, and a four-wheel-drive vehicle that tried to come to his aid hit and killed a third man, said a senior police official, Faisal Rana. This seems to be the story of a caper gone wrong. Raymond Davis appears to be an intelligence operative who shot two Pakistanis, who are believed to be working for ISI, Pakistan's intelligence service. The backup team on the way to the rescue hit and killed an innocent bystander, panicked and left the scene. The dispute between the US and Pakistani government is whether Davis had diplomatic immunity and could stand trial for murder in Pakistan. There is a further dispute whether Davis was acting in self-defense as some accounts indicate that he was not being robbed and in fact had shot one of the victims in the back while the victim was fleeing. It is important to remember that in the intelligence world there is no such thing as a friendly intelligence service. While services will cooperate on issues of mutual interest, they will always serve their own national interests first, even when that places them at odds with an intelligence service they are coordinating with. The facts of the incident that sparked all this are now fairly clear. Davis, in a rental car, was driving around in Lahore in areas where foreigners scarcely ever venture, tailed by two ISI auxiliaries on a motorbike. After an hour or more of trying to shake them off, they both came abreast at a stoplight. He pulled out a gun and, firing through his windscreen, shot them both. Accounts differ as to whether they made any threatening gesture, but one was killed as he was trying to run away. The backup van that Davis called for came roaring up the wrong way on a one-way street, ran over a cyclist, killing him, then turned around and roared off. Davis was arrested, and weapons, ammo and other paraphernalia were found in the car. On his cell phone were numbers that were later traced to phones in the tribal belt where the Taliban operate, while his camera had pictures of religious schools and military sites. For more analysis and discussion of the Davis Affair, see blog posts at Fabius Maximus here, here and here. It appears that the Pakistani government would love to find a face saving way to let Davis go home, but the incident has become a cause celebre in Pakistan and has the potential to become a spark for unrest much like the Mohamed Bouazizi story did in Tunisia. In the book of analysts, Pakistan is at serious risk of becoming another Egypt as food price inflation rampages through their economy. Should the Pakistani street go up in flames, what happens? How will it affect investor perception of India next door, a mainstay of the BRIC economies and emerging markets? Could it be the spark for investors to de-risk their emerging market exposure? Stay tuned. * Consider this following thought experiment. How would Americans have reacted if a British intelligence operative had been caught shooting FBI auxiliaries on the streets of Boston during the height of The Troubles on a mission against Provisional IRA terrorists? Would the State Department allow the British to claim diplomatic status retroactively for the intelligence officer? 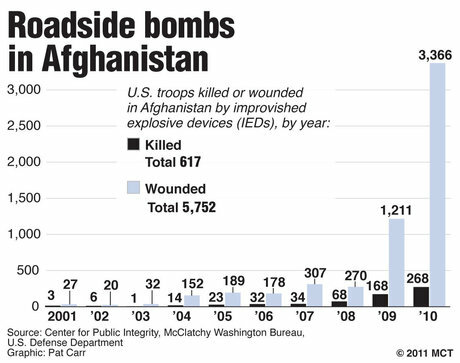 How much leeway should Americans allow the intelligence services of staunch allies to operate on thier own soil? On the other hand, my inner trader was staying bullish in the face of these risks because of bullish technical and sentiment readings. However, I remained highly aware of these extreme tail-risk events which could derail the markets. [E]vidence from surveys of relevant research indicates that academia has made little progress in finding practical ways for investors to protect even diversified portfolios from extreme events (crashes). Under these kinds of volatile market conditions, allocating some funds into market timing strategies makes sense. Abnormal Returns also discussed different approaches to market timing, of which the Inflation Deflation Timer Model is one of the variants. I know that the term "market timing" is a four-lettered word in some quarters, but given the current environment where extreme tail-events are more likely, buy-and-hold strategies are likely to lead to sub-optimal results. Better pricing power is a precursor to inflation - though the reported acknowledged that wages pressures was relatively weak. If we continue to get reports like this and oil prices back off so that they don't create a recession risk, then QE3 is likely off the table in 2H. A distant alarm bell may be starting to ring at the European Central Bank after data showed the euro zone's inflation rate is rising, manufacturing is powering ahead, unemployment is easing and the economic recovery is spreading to countries at the heart of the currency area's debt crisis. Investors should view June 30th, 2011 not as political historians view November 11th, 1918 (Armistice Day – a day of reconciliation and healing) but more like June 6th, 1944 (D-Day – a day fraught with hope for victory, but fueled with immediate uncertainty and fear as to what would happen in the short term). Bond yields and stock prices are resting on an artificial foundation of QE II credit that may or may not lead to a successful private market handoff and stability in currency and financial markets. 15% gratuities may lie ahead, but more than likely there is a negative two-bit or even eight-bit tip lying on the investment table. Like I did 45 years ago, PIMCO’s not sticking around to see the waitress’s reaction. For now, momentum is positive but risks are rising at the Fed's party. My inner investor is saying goodbye to the host is on his way out the door. My inner trader is having another drink, but edging away from the bar and moving closer to the exit. Be aware of the rising risk level. China gets it, when will America? A large share of the global population, including low-income groups in the developed economies, have not benefited from globalization but are suffering from inflation. Their reaction will put global stability in jeopardy. The major central banks may change their attitude toward loose money only when the riots happen in their own countries. Inflation is redistributive, usually unfairly. First, low-income people tend not to have debt, because they are usually not qualified to borrow from banks. When inflation surges, as it is happening now, their bank deposits erode in real value. Where do their losses go? The people who have debt and real assets, like property speculators, gain the same amount. Inflation essentially robs the poor and gives to the rich. Second, low-income people tend to have insecure jobs and cannot bargain wages up along with inflation, especially when inflation surges like now. The reduced purchasing power for their wages pushes them into an unsustainable situation. They simply cannot make ends meet. Recall that during the hyper-inflation days of the Weimar Republic, there was a roaring stock market where the suppliers of capital profited while the suppliers of labor got squeezed. We know what happened next. In 2009, 14.3% of Americans lived in poverty, according to the U.S. Census. Including ones that have given up looking for a job, one-sixth of American workers are underemployed or unemployed. A huge chunk of American people have no cushion against massive increases in the cost of food and energy. In addition, the prices of imported consumer goods that low-income Americans depend on are rising and are likely to rise much more, later in the year. Fifty million Americans are not so different from Egyptians in their economic plight. Riots could come to American cities. Consider the contrast in policy response between China and America. In a recent interview, Chinese Premier Wen Jiabao said that rising inequality is threatening social stability: "We will roll out measures in all these aspects, including tax policies, to make China a country of equality and justice where each citizen lives within the security net." Meanwhile in America, the Fed is focused on QE2, which is a policy designed to raise asset prices to benefit the suppliers of capital in hopes that the wealth effect boosts economic growth. Meanwhile, the suppliers of labor will have to bear the brunt of the adjustments. Notwithstanding the events in Wisconsin, Moody's estimates that the GOP plan to cut the deficit would cost 700K jobs and slice 0.5% off GDP growth. China gets the social risks of rising inequality. When will America? Investment response: My inner investor is highly mindful of these risks, but my inner trader tells me to enjoy the party that the Fed is throwing but to stay near the exit.